The Vulcan match factory started in Tidaholm in 1868. From the start there were problems. In the first year , 1868, the factory burned down. Subsequently a new factory was built. In 1870 there were 122 employees and a production of 19 200 boxes each day. 1875 was a tragic year, as both of the factories burned down. On February 18th. 46 young women were killed in the fire. The board made a decision to rebuild the factory. In 1897-98 The Vulcan matchfactory started a print works for the labels. At the end of the century The Vulcan match factory in Tidaholm was the largest match factory in the world. 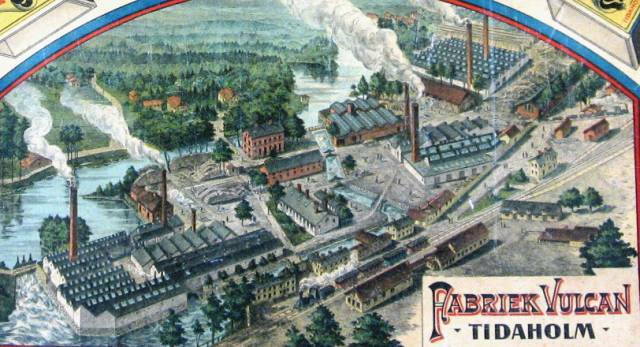 In 1915 there were 1.400 employees and a production of 2 448 576 matchboxes daily. Today there are about 200 employees with a capacity of 4-5 million boxes daily. There have been 150-170 match factories in Sweden. Today is The Vulcan match factory in Tidaholm the only one left. Vulcan registered the globe as a trade mark at Stationeers Hall in London 1870.